Happy Easter, everyone! I am really blessed to be spending this weekend with family and friends, and you can bet we'll be sharing all of our favorite recipes. Desserts are always the most popular dish at my family dinners. We firmly believe in eating dessert first.You can bet this recipe by Kraft won't last long. 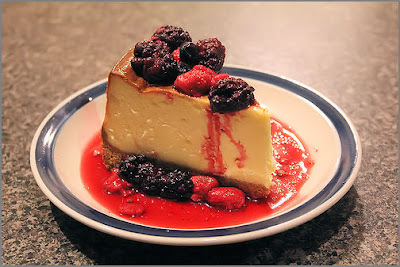 Kraft Foods has outdone themselves with this yummily light Low-Fat Berry Cheesecake! SPRINKLE graham crumbs onto bottom of 9-inch pie plate sprayed with cooking spray. Beat next 5 ingredients with mixer until well blended. Add eggs, 1 at a time, mixing on low speed after each just until blended. BAKE 45 min. or until center is almost set. Cool completely. Refrigerate 3 hours. Top with fruit just before serving; drizzle with jelly. Place 1 completely unwrapped package of cream cheese on microwaveable plate. Microwave on HIGH 15 sec. Add 15 sec. for each additional package of cream cheese. Terrific! You are so welcome. I love hearing that your children liked it, too!